If you want a swimming pool and you want one as quickly as possible, you may opt for a vinyl liner pool. What is a vinyl liner pool? This is a question the swimming pool contractors from Tipton Pools in Knoxville, TN get asked all the time. Bottom line, a vinyl liner pool is the least expensive of the pool construction materials and is one of the quickest pool projects to construct. They are flexible in color, shape and size. Vinyl may not be as flexible as concrete in its design, but there is a design style to suit most every design taste. You will want to chose the thickness of the vinyl liner. The thicker, the more it will cost; the thinner the lower the price tag. Thicker will be less prone to rips and tears and that is a consideration for many potential pool owners. Accessories. You can add many design elements to your vinyl liner pool project. Choose from fountains, steps, deep end and shallow end, benches as well as color and design options for the vinyl liner. Don’t forget about custom pool lighting as well — this is both aesthetically pleasing and amps up the safety of nighttime swimming. When you’ve chosen the pool size and style, your pool contractor will excavate the area, install the girders to support the pool liner and begin filling the pool and backfilling the area behind the pool to support it. Vinyl liner pools are less prone to algae growth than other pool construction materials like concrete which has nooks and crannies that algae spores can live in until they bloom. Proper pool maintenance and water chemistry balancing is crucial to keeping the vinyl liner from fading. To protect your pool from rips and tears make sure that anyone who uses it removes all jewelry that could rip the liner. 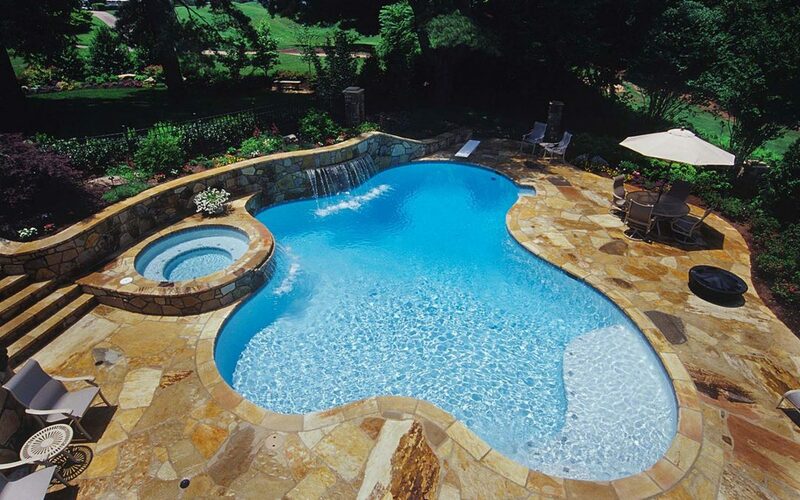 If you’re researching pool construction this year, give us a call and let’s talk about your family pool!